Law Web: When offence of criminal conspiracy is not made out in case of medical negligence? 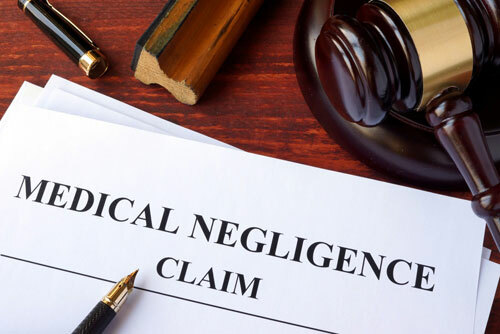 When offence of criminal conspiracy is not made out in case of medical negligence? Wife of Respondent No. 1 was under the medical treatment of delinquent doctors. She, however, could not survive. Her husband-Respondent No. 1 was not satisfied with the manner in which medical treatment was given by these doctors. He, therefore, lodged a written complaint with the West Bengal Medical Council against those three doctors alleging negligence and maltreatment of his wife by the said three medical practitioners. On receiving the complaint, the Medical Council referred the same to the Inquiry Committee. This Committee comprised five doctors (other Appellants were the members of the Medical Council). The Inquiry Committee took opinion of certain experts in their field and the opinion of the said experts was in favour of the Complainant. Notwithstanding the same, the Inquiry Committee submitted its report giving findings that the delinquent doctors were not at fault. On the basis of that report, they were exonerated by the State Medical Council. The Complainant had also initiated proceedings against the delinquent doctors before the National Consumer Disputes Redressal Commission (NCDRC) alleging deficiency in service against several medical practitioners including the said three delinquent doctors. Though NCDRC rejected the complaint, in the appeal filed against the orders of the NCDRC, the present Court held the said delinquent doctors guilty of negligence but at the same time, it was found that their negligence was not of criminal nature but of civil consequence and, therefore, awarded damages in favour of the Complainant and against the delinquent doctors. It had been finally held that they acted with negligence while according medical treatment to the wife of the Complainant. The Complainant filed criminal complaint against the members of the Inquiry Committee of State Medical Council including the Appellants alleging that they had committed offence under Section 201 read with Section 120B of the Indian Penal Code, 1860. The complaint was founded on the allegations that even when there were four reports of four different medical experts to the effect that delinquent doctors were guilty of professional misconduct as they had acted with negligence while giving medical treatment to the wife of the complainant, these Accused persons entered into conspiracy to save the delinquent doctors. The concerned Magistrate took cognizance of the said complaint and issued process. On receipt of the notice, the Appellants challenged the proceedings before the High Court submitting that no case of conspiracy was made out in the complaint and the 'complaint was malicious and untenable' and it could not be said that any offence by the Appellants was committed under Section 201 read with Section 120B of the Indian Penal Code, 1860. The High Court dismissed the petition. 120B. Punishment of criminal conspiracy.--(1) Whoever is a party to a criminal conspiracy to commit an offence punishable with death, imprisonment for life or rigorous imprisonment for a term of two years or upwards, shall, where no express provision is made in this Code for the punishment of such a conspiracy, be punished in the same manner as if he had abetted such offence. 16. Here again, criminal conspiracy that is referred to and defined Under Section 120A Indian Penal Code has to be in furtherance of committing an offence punishable with death, imprisonment for life or rigorous imprisonment for a term of two years or upwards etc. The alleged conspiracy even as per the complaint was not to commit any of the offences as mentioned above. As per the complainant himself, the so-called conspiracy, if at all, was to save the delinquent doctors in disciplinary proceedings taken against them. This provision also, therefore, has no application. Asoke Kumar Chaudhuri and Ors.Vs. Kunal Saha and Ors. 2. We have heard the counsel for the parties finally, with their consent, as the matter was fixed for final arguments by this Court. 3. The issue that is involved in the present appeal does not require stating of the facts in detail. We would, however, recapitulate those facts which are absolutely essential for deciding this matter. 4. Wife of Respondent No. 1 was under the medical treatment of Dr. B. Halder, Dr. Abani Roychowdhury and Dr. Sukumar Mukherjee (hereinafter referred to as delinquent doctors). She, however, could not survive. Her husband-Respondent No. 1 was not satisfied with the manner in which medical treatment was given by the aforesaid doctors, as according to him, their negligence in performance of their duties as doctors led to the death of his wife. He, therefore, lodged a written complaint with the West Bengal Medical Council against those three doctors in the year 1999 alleging negligence and maltreatment of his wife by the said three medical practitioners. On receiving the complaint, the Medical Council referred the same to the Penal and Ethical Cases Committee No. 1 (hereinafter referred to as 'Inquiry Committee') with instructions to conduct an inquiry into the allegations made in the said complaint. This Committee comprised five doctors (other Appellants were the members of the West Bengal Medical Council). 5. It appears that this Inquiry Committee took opinion of certain experts in their field and the opinion of the said experts was in favour of the complainant. Notwithstanding the same, the Inquiry Committee submitted its report giving findings that the delinquent doctors were not at fault. On the basis of that report, they were exonerated by the West Bengal Medical Council. However, it may be mentioned that the complainant had also initiated proceedings against the delinquent doctors before the National Consumer Disputes Redressal Commission (NCDRC) alleging deficiency in service against several medical practitioners including the said three delinquent doctors. Though NCDRC rejected the complaint, in the appeal filed against the orders of the NCDRC, this Court held the said delinquent doctors guilty of negligence but at the same time, it was found that their negligence was not of criminal nature but of civil consequence and, therefore, awarded damages in favour of the complainant and against the delinquent doctors. This judgment is reported as 'Molay Kumar Ganguly v. Sukumar Mukherjee' [MANU/SC/1416/2009 : 2009 (9) SCC 221]. 6. It is clear from the above that insofar as the three delinquent doctors were concerned, it has been finally held that they acted with negligence while according medical treatment to the wife of the complainant. 23. That on the backdrop of what has been canvassed in the foregoing paragraphs, it is most palpable and glaring that the accused persons had entered into a deep-rooted criminal conspiracy amongst themselves to screen the offenders and in pursuance to that, as overt acts, the accused persons knowing fully well that the offending doctors had committed the offence of medical negligence and thereby caused death of the wife of the Petitioner, deliberately concealed and withheld the evidences and/or information relating to the said offenders with the intention to save their skin and thereby committed the offence punishable Under Section 201 of the Indian Penal Code read with Section 120B of the said Code. 8. The concerned Magistrate took cognizance of the said complaint and issued process. On receipt of the notice, the Appellants challenged the proceedings arising out of the said complaint by filing petition Under Section 482 of the Code of Criminal Procedure (Cr.P.C.) in the High Court of Calcutta being C.R.R. No. 4243 of 2011 submitting that no case of conspiracy was made out in the complaint and the 'complaint was malicious and untenable' and it could not be said that any offence by the Appellants was committed Under Section 201 read with Section 120B of the Indian Penal Code. The High Court, after hearing the parties, dismissed the said petition vide impugned judgment dated 01.07.2013 and it is this judgment which is impugned in the present proceedings. 9. A perusal of the judgment of the High Court would disclose that the High Court has discussed the matter in detail as to whether prior sanction of the Medical Council was required in view of the provisions of Section 197 of the Code of Criminal Procedure, inasmuch as one of the submissions of the Appellants was that no such complaint could be filed without such a permission in view of the provisions of Section 27 of the Bengal Medical Act, 1914, which bars suit or other legal proceedings in respect of any act done in exercise of any power conferred by the said Act on the State Government or the Council or any Committee of the Council or the Registrar. We are not adverting to that discussion as we would be dealing with the matter on merits. 17. In the instant case, the complaint of Dr. Saha relates to nondisclosure or non-consideration of the four expert reports. This, he alleges, is deliberate suppression to screen the offenders, and causing disappearance of evidence of offence. By the term offender, he implies the doctors against whom he brought the actions before the Council, Court of the Chief Judicial Magistrate, Alipore and the NCDRC. As regards the case brought by Dr. Saha in the Court of the Chief Judicial Magistrate, Alipore, there has been final acquittal of the accused doctors in the Hon'ble Supreme Court. Thus, suppression of such reports could not constitute disappearance of evidence respecting a penal offence or screening the offender, even if the allegations of deliberate suppression are assumed to be correct. Nor can such suppression sustain the charge of screening an offender, the Hon'ble Supreme Court having acquitted the accused doctors. 11. After hearing the counsel for parties, we are of the opinion that the aforesaid approach of the High Court is unsustainable in law and it has committed grave error in not dealing with the matter in proper perspective. 12. We have already stated in brief the allegations which are made by the complainant in the said complaint in an attempt to rope in the Appellants for offence Under Section 201 and Section 120B Indian Penal Code. We are of the opinion that even if the allegations in the complaint are taken as true and at their face value, it would not constitute offence under the aforesaid provisions. if punishable with less than ten years' imprisonment.--and if the offence is punishable with imprisonment for any term not extending to ten years, shall be punished with imprisonment of the description provided for the offence, for a term which may extend to one-fourth part of the longest term of the imprisonment provided for the offence, or with fine, or with both. 14. As is clear from the bare reading of the provisions of the aforesaid Section, an offence under the said Section would be treated to have been committed when a person, knowing or having reason to believe that an offence has been committed, causes any evidence of the commission of that offence to disappear. What is relevant is that the evidence which is made to disappear relates to the commission of the offence. In the present case, the allegations against the delinquent doctors of their negligence were of a much prior date. The complainant had sought to make out a case that the opinions of the four experts which were taken by the Committee itself were not reflected in the report that was submitted and it is this 'evidence' which was made to disappear by the members of the Inquiry Committee. Obviously, it is not a kind of evidence that is referred to Under Section 201 Indian Penal Code. Thus, on a plain reading of this provision, the allegations contained in the complaint do not make out any case of committing an offence Under Section 201 Indian Penal Code. 17. Faced with the aforesaid situation, Mr. M.N. Krishnamani, learned senior Counsel appearing for the complainant, submitted that the allegations contained in the complaint would constitute an offence punishable Under Section 219 Indian Penal Code. Though no such provision is mentioned in the complaint, Mr. Krishnamani is right that the allegations made in the complaint may constitute an offence under the aforesaid provision and mere non-mentioning of the said provision in the complaint would not make any difference. For this reason, we have considered the argument predicated on this provision as well. We fail to understand as to how even the provisions of Section 219 Indian Penal Code applies in the instant case. 219. Public servant in judicial proceeding corruptly making report, etc., contrary to law.--Whoever, being a public servant, corruptly or maliciously makes or pronounces in any stage of a judicial proceeding, any report, order, verdict, or decision which he knows to be contrary to law, shall be punished with imprisonment of either description for a term which may extend to seven years, or with fine, or with both. 19. The ingredients of the aforesaid Section are: (1) the person charged is a public servant; (2) the said public servant corruptly or maliciously makes or pronounces any report, order, verdict, or decision which he knows to be contrary to law (3) such act is to be done in any stage of a judicial proceedings. Without going into the controversy whether the Appellants would be treated as public servant or not, it is sufficient to state that the departmental proceedings into the report given by the Committee cannot be treated as 'judicial proceedings'. 20. Judicial proceedings are defined in Section 2(i) of Code of Criminal Procedure. to include any proceedings in the course of which evidence is or may be legally taken on oath. 22. It cannot be said that the departmental proceedings, which were initiated against the delinquent doctors and in which five of the Appellants constituted Inquiry Committee, evidence could be or would have been taken on oath. 23. Thus, even if, for the sake of argument, we presume that the Members of the Committee had side-tracked and deliberately ignored the report of the experts helping the delinquent doctors to go scot-free, it does not make out any criminal offence said to have been committed by these Appellants under the provisions of Indian Penal Code. If there was any other remedy available to the complainant, he could have availed the said remedy but insofar as the complaint filed by him for initiating proceedings against the Appellants Under Section 201 read with Section 120B Indian Penal Code is concerned, it was not clearly maintainable. 24. The result of the aforesaid discussion is to allow this appeal and quash the complaint filed by the Respondent against the Appellants.